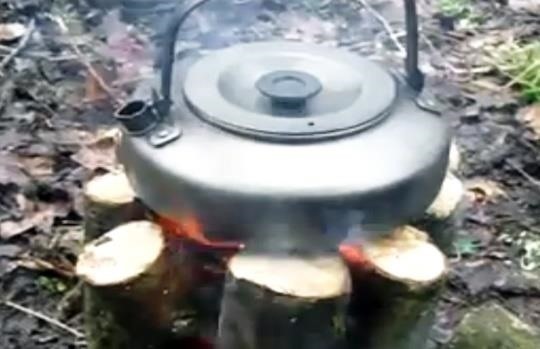 In the video below, YouTube user Doogly demonstrates how to make a Swedish torch, which is also known as Swedish candle, Canadian candle, Swedish fire torch, Swedish log stove, or similar name, using a chainsaw. Basically, instead of tossing any firewood into your fire pit, grab one thick log and make two cuts. These cuts should be deep, at least halfway through the log, and should form an X on the top. Once your cuts are created, add fire kindling such as newspaper, brush, or even wine corks into the depths of the log and light them. Remember to keep the X facing upwards, so the flame rises from within the log rather than downwards and dangerously toward the ground. If you don't have a chainsaw, you can attempt to use many thick cuts of wood together in the same shape, but you won't get the same exact effect. Once you've lit your newly cut log, you have a long-lasting fire that will keep burning until you're ready to hit your tent. 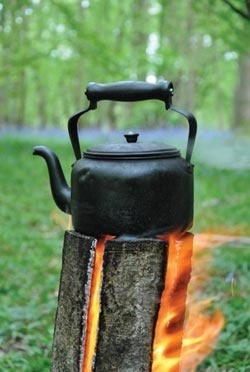 Yet this fire building technique offers more options than simply warmth and light—it also provides a ready-made stovetop for your camp cooking. Nick Weston, writing for Back Woods Home, considers this log-cutting technique an excellent choice for outdoor chefs roughing it. After about 30 minutes of burning, the log's flat top becomes the perfect place to set a skillet. 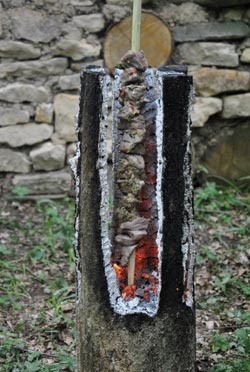 As the wood and its flame continue to burn, it reaches a high enough temperature to cook on top of. And, the longer it remains lit, the higher the temperature—meaning you could even slow-roast your favorite meat directly inside of the log. Another benefit to this easy-to-create camp stove is that it requires no effort. The log will continue to burn through the cuts, heating the wood from within its center and warming whatever you place on top. Nick Weston also suggest considering what type of log you'd like to use before creating this long-burning fire. Different types of logs create different effects as they burn, and your choice may depend on the purpose of your campfire. He recommends selecting a "well-seasoned" wood, rather than one that is stripped of its bark and natural growth. 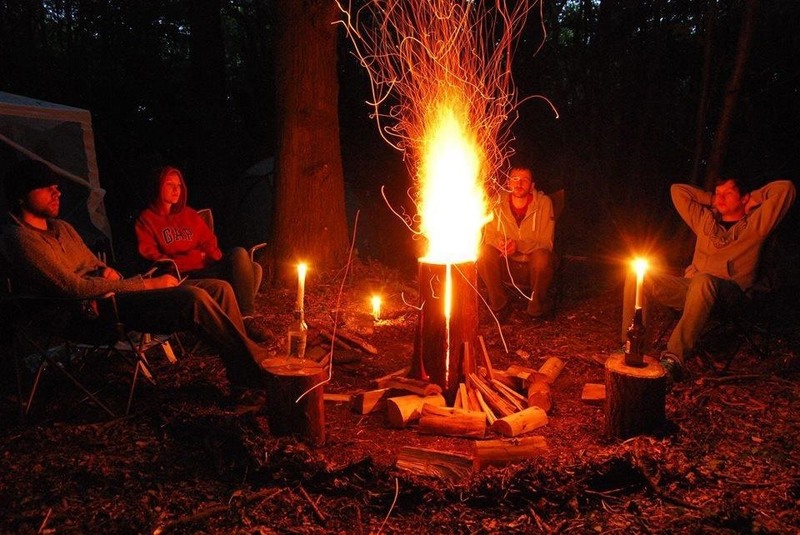 If you simply want to relax around your campsite, seek woods like pine, fir, and birch. Weston calls these soft woods, which give off the scent and light of the traditional campfires we all love. However, this type of wood log isn't the best for cooking food. If you plan to make your fire your own outdoor stove, Weston suggests avoiding any varieties of wood that give off soot and smoky taste. Instead, try to use hardwoods like beech, apple, cherry, and oak. These logs don't hold much moisture, which prevents excess smoke, and burn better, according to Weston. this is awesome for being in the nature. 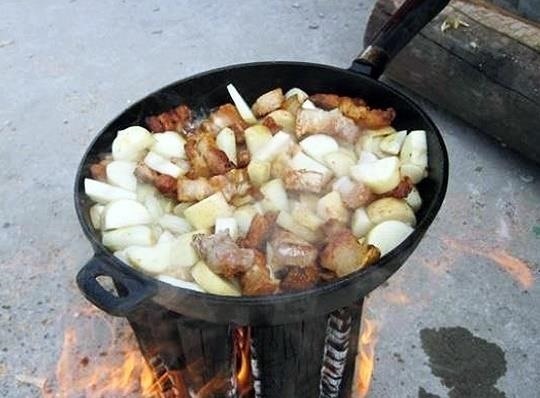 Nice idea even for doing some special BBQ in monther nature!!! This is pretty cool, can't wait to try it. One question though; do all Hobos carry chainsaws? You can probably get the same result with a couple of well placed axe blows. I was wondering about an axe too. The log would just want to split all the way through, but apparently that is fine. You could even use a machete if that's all you have. It just won't be as stable for cooking probably.